Apprentices and employers from across the North West had cause for celebration when they attended the 26th Annual Alliance Learning Awards Evening on Thursday 21st June 2018. 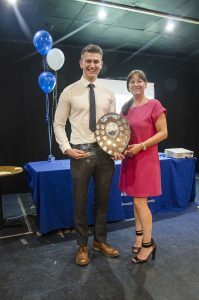 The Awards Ceremony, which recognises and rewards the hard work and commitment of learners and the businesses that support them, was held at The Horwich RMI for the second year running. The Awards Evening was attended by local businesses, learners and their families as well as members of the Alliance Learning Board of Trustees, the Deputy Mayor of Horwich, local MP Chris Green, representatives from the Lancashare, Mancheshare, GTA England and the event sponsors for the sixth year running MBDA UK Ltd.
Alliance Learning Marketing Manager, Chloe Ramsden, hosted the ceremony this year and Acting Chief Executive, Kelly Perkin, presented the awards for each of the 17 categories on the night. The evening also consisted of two guest speakers, Pete Conor of Pure Companies and Alex Kitchen of Velden Engineering who both shared their own experiences of being apprentices. The highlight of the awards evening is the much coveted overall ‘Apprentice of the Year’ award. This recognises the person who has shown exceptional commitment to their training programme throughout the last year from the Apprentice of the Year winners. This year the award was won by David Thomas of William Hare Group. During the ceremony David was described as a learner ahead of his years in both maturity and ability and is a credit to both William Hare and Alliance Learning. He was also described as the ideal role model for any future apprentices, someone who will go the extra mile to help and develop the younger people within the business. “2017 – 2018 has been yet another truly fantastic year for the organisation. We have successfully retained our Matrix Standard following a 3 day inspection. This demonstrates the very good Information Advice and guidance we give to our Learners, employers and customers. We became one of only 715 providers in the country to obtain a contract to deliver apprenticeships to Non-Levy employers, including SME’s that are vital to our economy. From this we have started delivering new Apprenticeship Standards in Engineering, Business and Business Management at Level 5. We were also highly commended as Learning Provider of the Year at The Greater Manchester Business awards and our winner of last year’s Apprentice of the Year, Daniel Blake, was also recognised at the National GTA Apprenticeship Awards to win Engineering Apprentice of the Year.